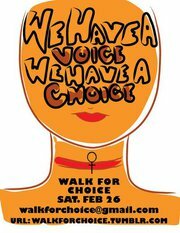 Revolution Books was part of Walk For Choice on February 26 in Oakland. Check out the main blogsite for the Walk. And here is an article on the current, dangerous attacks on women and abortion posted at the World Can't Wait website. Here is a short slideshow with music we borrowed from the Walk for Choice website. 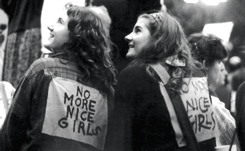 In the 1960s and 70s millions of people rebelled against traditional morality. The movement for women's liberation raised and fought for abortion rights for women. We will never go back. There is nothing immoral about terminating an unwanted pregnancy. A fetus is not a baby. If a woman doesn't want to continue a pregnancy all the way (for whatever reason), she should have the freedom to end it, safely and easily. There is nothing tragic about it. If a woman is not allowed to control her own body, her own reproduction, not allowed to decide whether or not or when to become a mother, she has no more freedom than a slave. We need a movement that boldly stands up for the morality of equality, and a critical and scientific understanding of the world and human reproduction. If we build such a movement, we will find that people are receptive and many are waiting for someone to stand up and say ENOUGH nonsense! And here is another great piece: The Facts of the Matter: Fetuses Are NOT Babies, Abortion Is NOT Murder, and There Is No Such Thing as "Partial-Birth Abortion"
Walk for Choice 2011 was created in direct response to the events in Congress surrounding The No Taxpayer Funding for Abortion Act (H.R. 3). It will take place in multiple cities on February 26th, 2011, but we encourage all participants to spread the word now—-after all, that’s how we grew so large in the first place! Walk for Choice is a virtual event with a street-team approach. Walk for Choice is not a traditional American protest. It is a moving target; any and all can join the walk at any point. Anyone who is interested in protecting access to abortion services and reproductive rights may attend. We are currently coordinating support centers and headquarters in your area. Click here to find or organize a walk in your area!